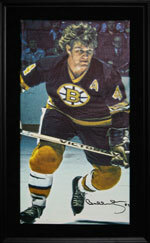 Another action shot of Bobby late in his career with Boston. This photo is copied on a 14" x 28" canvas with a deluxe floater frame tipped to suede matting. It is a Limited Edition of 144. 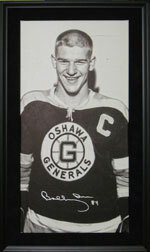 In 1965, Bobby was captain of the Oshawa Generals. This was his last year in the OHL before going to the Boston Bruins. This photo is copied on a 14" x 28" canvas with a deluxe floater frame tipped to suede matting. It is a Limited Edition of 144.